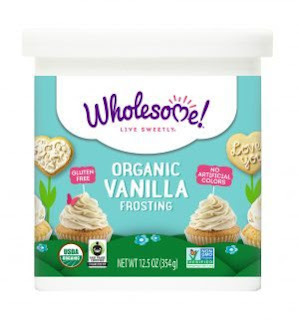 Living a Fit and Full Life: Organic and Non-GMO Frostings by Wholesome! are Out of this World Delicious! Organic and Non-GMO Frostings by Wholesome! are Out of this World Delicious! At Wholesome! we are committed to providing the most delicious Fair Trade Certified, Organic, Natural and Non-GMO Project Verified sweeteners sourced from ethically and environmentally responsible growers and manufacturers. We provide safe and flavorful sweeteners that are produced with respect for food safety, the environment and human welfare. We strongly believe in the importance of sustainable and organic agriculture to encourage a safe and beautiful future for the planet and its people. We believe protecting the environment through sustainable farming is critical to a healthy planet and healthy people. We believe that the farmers who feed the world every day deserve a fair price for the crops they grow. Also Available in Chocolate and Wild White Strawberry! Wholesome! Organic Vanilla Frosting’s delicious flavor and ready-to-use convenience make it a pantry staple for all your last minute baking needs! It has a smooth, spreadable texture – perfect for topping cakes, decorating cupcakes and adding a sweet finish to your favorite cookies! Wholesome! Organic Vanilla Frosting lives up to the ethical and sustainable standards you have come to expect from Wholesome! Our frosting is Non-GMO Project Verified, Fair Trade Certified, Gluten Free, Kosher and Vegan. Our delightful frosting is made from our Organic Powdered Sugar and contains NO high fructose corn syrup or artificial colors! The oil is sustainably sourced and the jars are recyclable and BPA free. It is perfect for busy moms & dads who need a quick batch of cupcakes for the school bake sale or birthday party. The Fair Trade Certified logo is Wholesome!’s guarantee that our farming cooperatives are paid directly for the cane they grow and mill. This means that farmers can compete with factory farms, cultivate the quality of their crops, send their kids to school and build thriving communities. Watch this video of one of our Paraguayan farmers who shares the impact Fair Trade has had on his life and community. 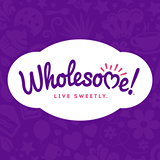 Thank you for choosing Wholesome! Organic and non-GMO frostings by Wholesome! are out of this world delicious! I love frosting and have become such a snob in my old age that I usually prefer homemade to anything else. This past weekend I had the pleasure of trying Wholesome! Organic Vanilla Frosting and I was completely blown away! My girls and I made some sugar cookies and they topped them with Wholesome! Organic Vanilla Frosting and boy were they delicious! The frosting tasted just like homemade frosting. It even looked and smelled like homemade. As a mom of 3 girls I love baking in the kitchen with my girls but with a 1 year old little boy I'm usually pressed for time. I love that I can simply pick up a can of Wholesome! Organic Frosting and save some serious time in the kitchen. Whether you're making a cake, cookies or any other dessert that calls for frosting I highly suggest you pick up a can of Wholesome! Organic Frosting and save yourself some time in the kitchen. Not only will you save time but you won't have to sacrifice that homemade flavor that us true dessert lovers desire! Click HERE to learn more about Wholesome!! Follow Wholesome! on social media!